﻿ Pavillon Italie Paris. JIMAT di Agoda.com! Hotel telah dibina pada 1999. Hotel melalui pengubahsuaian pada 2003. Hartanah ini terdiri daripada 89 bilik. Hotel terdiri daripada 89 dua bilik. Hotel terkenal ini ideal untuk pelancong perniagaan dan percutian. Tetamu boleh menikmati kemudahan khidmat sambut tetamu 24 jam. Hotel menawarkan peti simpanan yang selamat kepada tetamu untuk menyimpan barangan berharga. Tetamu boleh menyimpan kot di dalam bilik menggantung kot. Hotel menyediakan lif. Hotel mempunyai rak surat khabar. Tetamu boleh menggunakan akses internet supaya dapat terus bekerja atau berhubung dengan yang tersayang. Terdapat perkhidmatan dobi. Hartanah boleh diakses dengan kerusi roda. Tetamu boleh menggunakan tempat letak kereta di premis. Daftar keluar pada . Premis ini membenarkan haiwan peliharaan. Haiwan peliharaan dibenarkan dibawa ke dalam premis. Harap maklum sarapan berharga EUR 8.50. Comfortable hotel good value for money. was the worst 3 nite stay ever!!! first room given was mouldy.... lodge a complain and the staff asked me to go down to the reception to take 2 other room keys to see which suites me best. at the end I chose room as it was the cleanest of all rooms give... cleanest means the best of those and doesn't mean the mould is still not there. very eerie walk to the metro and tram station pass 8pm. only plus point is, nice halal Turkish restaurant within 7minutes walk from the hotel. there are also a shopping mall with huge supermarket within 10mins walk just after the restaurants. 10minutes walk to the metro and tram station. Generally OK, but internet abysmally slow. Though the hotel is not close to the famous attractions, it is surrounded by residential buildings that you can feel the quiet Paris and go into the life of local people. There're a lot of local cafes, markets and restaurants in that area. It was a really interesting experience. The hotel is spacious, clean and tidy in general. However, all the lamps in the toilet were went off suddenly in our first night and needed to finish a shower in dark which caused a little bit inconvenience. Luckily the lamps were fixed the next day when the technician was on duty. Thanks for the followup from the staff in front desk. Free wifi service is provided in the hotel room. Probably because our room assigned is near the end of corridor, the signals are very weak. After I walked to the corridor, it worked very fine. Not very good. The hotel facilities are average, a little run down. Breakfast is very basic, and very expensive for what is actually on offer. Not recommended for business travelers: internet access in the rooms is dismal; there is no wireless access at all in the lobby. There is one computer available but the hardware is literally falling apart. The receptionist was not even aware that there was no printer available. the hotel is located just a little the centre of paris. the looks of the hotel is quite ok, however you mostly can't get anything from the staff itself (not even an empty bottle). the staff doesn't speak/understand english very well, so it's quite hard to communicate with them.the bathroom is also not very clean with many little bugs and other critters running around, plus the lobby closes around 2am, so i don't recommend it to people who are going out late. The Hotel is alright and Neat..One can have a comfortable stay & Good Room Service. Staffs at reception are nice & do best to provide with all information required. They even provided us with an Umbrella when it was raining out & we couldn't leave the Hotel without an Umbrella. If u r looking for a pleasant stay I can keep this hotel in short list. 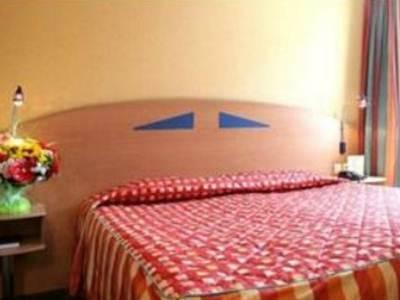 The location is a bit far from tourist attractions, but the hotel is good, clean, and professionally managed. I would recommend this hotel for those who are on business trip. 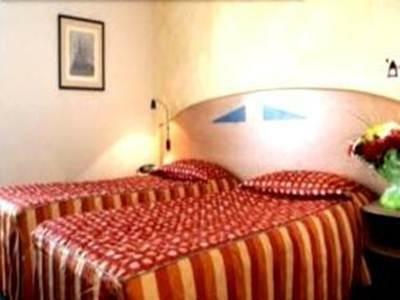 pavillon italie is located on the outside of paris where is not far from the charles de gaulle airport. we took a taxi airport and paid for only 40 euro. the transportation by the metro where we can walk easily ,just only 5 minutes. it would be great if you love eating asian food because you can find the china town around the metro station,port d'italie. while we were staying in paris , we enjoyed eating and sightseeing very much. directions on the hotel website didn't work for us, we stopped at le kremlin bicentre stop on the metro and it was a super long walk with our backpacks. eventually we did find our hotel, and the receptionist was very helpful. we are very happy with the location (nice room, near to metro and china town for a good bite) but the room is noisy because it is just next to a highway and hospital with frquent ambulance alarm. i stay for 3 nite. during day time i went round the paris city. so I use the hotel for resting at nite and take breakfast in the morning. This is the first time for me to visit Paris. The hotel was in a nice location, walking distance to the Metro station. You can get basically get to anywhere in Paris for about 20-30 minutes. The room is pretty standard though, with no view, and seems a bit old. Cleanliness was OK but not excellent. However for its price it is certainly a great value. The receptionist from Algeria was friendly and helpful, and spoke good english. The breakfast was minimal, cereals and cheese, so don't expect a proper hotel buffet. There is wifi in the lobby so that is certainly a plus. Although location is good, it can be a bit tricky at first to get to the hotel so just make sure that you know which station to go to. Once you're at the hotel the receptionist can help you orient yourself. the hotel is "hidding" at the lower part of the hill, is a bit difficult to locate the place and luckily we bump into a friendly french lady who also stay nearby. the whiteman at the recept are friendly but not the blackie... there's no cup/kettle available in the room, but they allows us to refill the hot water at the recept every now & then. 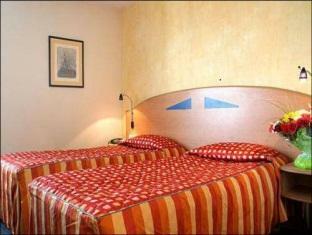 overall is a good location which is only 5-7 mins away to pal d italie metrol station. is safe althought there's security guard, pretty clean as they do have daily room services. No glass in room for me to drink water. But front desk is helpful and give me glass and hot water.